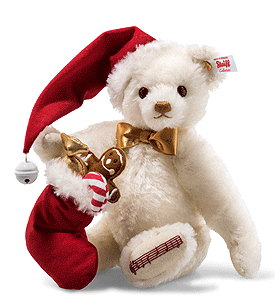 Sweet Santa Musical Teddy Bear by Steiff. A beautiful limited edition Steiff item, hand made in white mohair. Worldwide Limited edition of only 1225 pieces. Musical melody plays, Jingle Bells . Comes boxed, together with a numbered certificate of authenticity. “Oh what fun it is to ride in a one-horse open sleigh ...” When Sweet Santa Teddy bear is out delivering his presents, you can hear him coming from miles away. The Jingle Bells melody jingles along merrily with every movement and the notes of the song are even shown on the sole of his paw. And, true to his name, Sweet Santa comes “bearing” sweets for everyone he visits. Maybe even you?